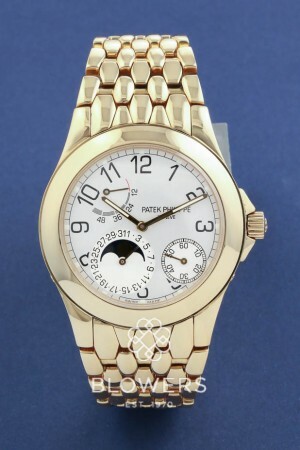 18ct Yellow Gold Patek Philiipe Neptune 5085/1J-011. 18ct Yellow Gold Patek Philiipe Neptune 5085/1J-011. Automatic movement. 37mm diameter case with a silver arabic dial. Small seconds between the 4 and 5 o’clock position. Date wheel with moonphase display between the 6 and 8 o’clock position. Power reserve indicator between the 10 and 11 o’clock position. 18k yellow gold bezel and bracelet with a concealed clasp.Sapphire glass and transparent case back. Box and papers dated July 2006. SKU: 3034317. Categories: Patek Philippe.